When a doorway to a parallel universe opens in the U.S.S. Enterprise Transporter Room, Kirk, Spock and Scotty appear changed, but not for the better! Inspired by the iconic "Mirror, Mirror" episode of Star Trek, this buildable Transporter Room features six platforms, a computer console, interchangeable glow-in-the-dark wall panels, and hinged sections that open up to display up to six figures. The set comes with three highly detailed, super-poseable micro action figures, including Captain Kirk, Spock, and a translucent, materializing Scotty, all in iconic "Mirror, Mirror"-themed outfits. Handle all types of dangerous situations in all-too-familiar form in the Transporter Room collector construction set by Mega Bloks Star Trek! 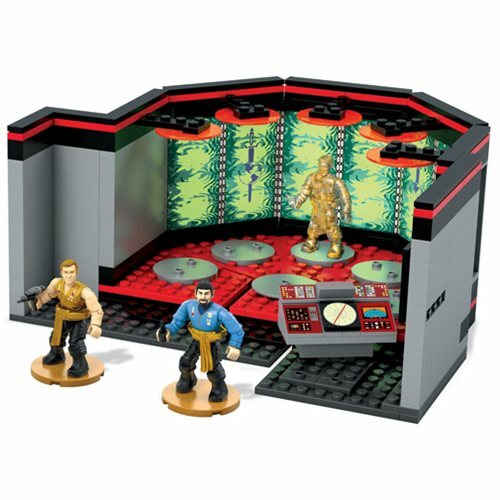 Star Trek: The Original Series Mega Bloks Transporter Room Playset includes 321 pieces. Ages 12 and up.